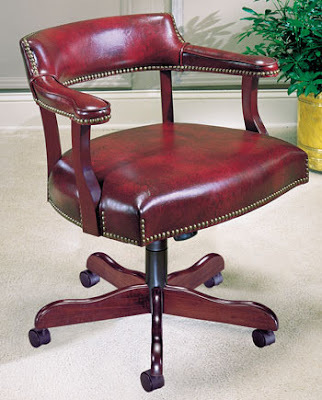 This is an excecutive chair from High Point, NC. In business since 1958, HPFI (High Point Furniture Industries) is committed to providing the office furniture industry with quality products quickly and dependably. HPFI manufactures and markets wood office casegoods and upholstered seating for a wide range of commercial markets and applications. The production of HPFI is based in two manufacturing facilities located in High Point, NC. These two facilities offer more than 440,000 sq. ft. of production space capable of managing projects of any size. Now HPFI is large enough to manage virtually any size project, yet small enough and more importantly, willing, to assist customers with rush orders, modified and custom product requests. HPFI is green. As a company, they continue working on reducing their carbon footprint.